Trends are seeing the petticoat demanded more and more as a general fashion wear garment. There is demand from a much wider range of customers outside of the traditional dancewear market now wanting to own a petticoat. Rockabilly, Vintage wear and Alternative fashion fans are all wearing petticoats and the petticoat is now the must have fashion accessory in every girl's wardrobe ! There are many brands on the market in many styles and fabrics. It is best to choose a well-known and reputable brand name or you may spend time adjusting or repairing your new petticoat. Find a petticoat specialist who understands the important aspects of designing and producing high quality products. Remember, petticoats are an intricate and complex fashion garment. With each length and the desired result in mind, all petticoats need special attention during the design process to fall evenly and a petticoat specialist works hard to achieve just that. Length is important and pretty self-explanatory - the best way to know which length you need is to measure your dress or skirt from the waist to the hem as this is how the length of the petticoat is determined. Some ladies like to see the pretty bottom edge of the petticoat peeping out underneath their skirts. Consideration should be given to the look of your outfit and consider that if the petticoat slips a little, then it could cause the petticoat to sit with an uneven horizontal line thus causing the illusion that the hem line of your dress or skirt is uneven, which of course is not desirable. This is a good reason why most prefer a petticoat length sitting just a few centimetres shorter than the length of the dress or skirt hem. If the petticoat is too much shorter than the dress, (usually more than around 12cm), there could be a 'waterfall effect', which is not desirable either. The Spin Dance petticoat accommodates a wide range of fashion requirements. Constructed in comfortable high quality organza fabric for maximum fullness and finished with ribbon edging on all layers. The result is a very light weight and very floaty petticoat that dancers love for its ability to achieve a horizontal spin line when dancing. Vintage wear & 50's fashion wear enthusiasts take advantage of the fullness achieved under their dresses. Whether dancing or just wearing for fun, all enjoy the lightweight floaty feel of the classic Spin Dance petticoat. In some cases, you may need an Extra Full Double petticoat to accommodate special requirements if your full circle dress is made of a very heavy Vintage fabric and those requiring an extra full look ! The Extra Full Double petticoat finishes at the hem with 4 layers & 3 Tiers. This is double the construction of the standard Spin Dance petticoat which is actually giving a 4 layer double petticoat. Also available in the Spin Dance brand is a 75cm long petticoat which has 4 Tiers with graduating Layers to give a tapered even fall. With longer petticoats, they need special attention during the design process to fall evenly. 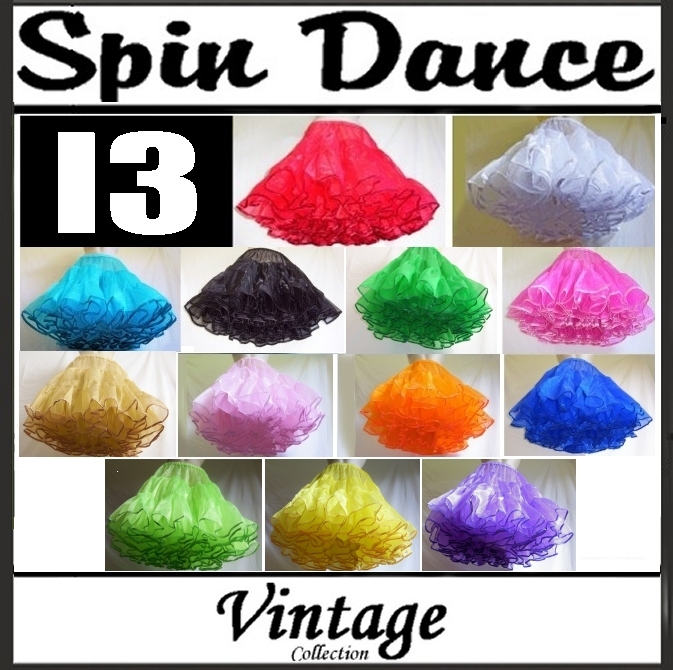 The Spin Dance petticoat in 4 lengths - 48cm, 55cm, 65cm and 75cm and in 13 colours in most lengths. Spin Dance also have petite, standard and plus sizes available. The Flirt n Betty petticoat meets the need of the growing number of general fashion wearers seeking petticoats. Many are first time petticoat buyers and they are looking for a fun flirty fashionable look and the Flirt n Betty petticoat meets this criteria perfectly. This 2 layer petticoat has a lovely ruffle trim with a satin topped tier. It has 3 additional tiers below of high quality soft Chiffon. The Flirt n Betty petticoat is a very feminine petticoat and deserves a place in every woman's wardrobe. Flirt n Betty is available in 3 lengths - 48cm, 55cm and 62cm and in 6 colours in most lengths. Flirt n Betty also have petite, standard and plus sizes available. On the left is the diagram showing the construction of tiers and layers of the Flirt n Betty petticoats. Just as the name suggests, the Vintage Demure petticoatis a more subdued design constructed with a satin top within the combined 3 tiers and 2 layers of soft micro-netting fabric and ribbon trim on both layers. Sometimes less is more and there are some who want the feel and fun of wearing a petticoat but also want a more demure look more suiting to their body shape or personal preference, especially when wearing the 20's, 30's and 40's vintage style of fashion. Vintage Demure is available in 3 lengths - 48cm, 55cm and 65cm and in 3 colours. Vintage Demure is available in standard and plus sizes. On the left is the diagram showing the construction of tiers and layers of the Vintage Demure petticoats.